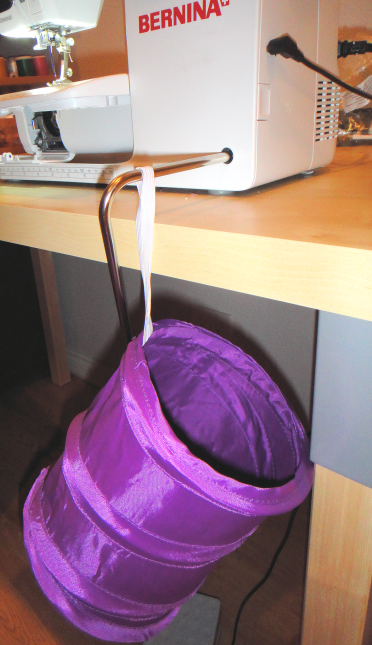 In my quest to keep my newly made over sewing space clean and organized, I recently discovered a small little product that will help me do just that. 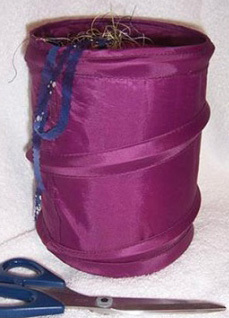 The Gypsy Bitty Buddy is a collapsible little nylon trash can that you can use in your sewing room or take with you when you go to classes. The opened size is 6″ diameter x 9″ high and the elastic loop holds it flat when it is collapsed. The Bitty Buddy doesn’t have to take up any table space when the elastic loop is placed over the arm of the Freehand System. Previous Previous post: Take Us Back to The Makerie, Please!